Edited by: Archiv und Museumsstiftung der VEM, Wuppertal. Author: Mark Charles Bilbe. Translated by: Elisabeth Steinweg-Fleckner. 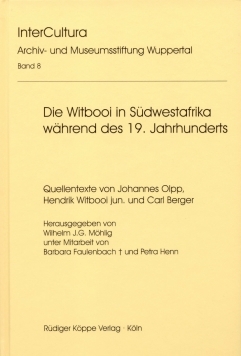 Author: Johannes Olpp †, Hendrik Witbooi jun. †, Carl Berger †. Translated by: Wilhelm J.G. Möhlig. Edited by: Wilhelm J.G. Möhlig. In collaboration with: Barbara Faulenbach †, Petra Henn. Author: Johannes Winkler †. Edited by: Helga Petersen, Alexander Krikellis. With a preface by: Achim Sibeth. With an introduction by: Wilfried Wagner. Author: Gilbert Clement Kamana Gwassa †. Edited by: Wolfgang Apelt. With supplementary material by: Wilhelm J.G. Möhlig. Author: Adelheid Meis †. Edited by: Ruth Engelbert †. With an introduction by: Ruth Engelbert †. With supplementary material by: Ruth Engelbert †. Author: Gidada Solon. Translated by: Gerd Röhm. Edited by: Gerd Röhm.